There are 23 posts in this thread, and it has been viewed 13727 times. There's also files attached. Hello, its time for a new Game of the Week! And its everyone's favorite puzzle game Puzzle Bobble/Bust-A-Move! Released on: MVS, AES, Neo-Geo CD, Wonderswan, SNES, ETC. 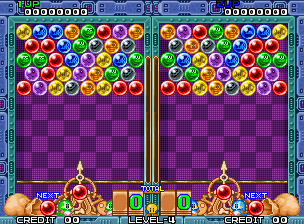 Puzzle Bobble/Bust-A-Move is a Neo-Geo game made in 1994 by Taito, the same company that made the popular Bubble Bobble Series, All you do in this game is shoot 3 bubbles of the same color to make them dissappear. You can even choose to play as Bub (1P) or Bob (2P), and the bubbles inside are the enemies from BubBob. Within 30 Stages and Catchy Music, PB/BAM is an essential Party Game. Play the Flash Version Here! 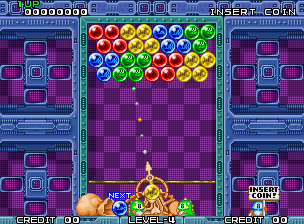 Puzzle Bobble is one puzzle packed game fine to play any time, talk about a treat for challengers. I don't know much about the many versions in existence or any extra features on them, but I find the GBA version and various Puzzle Bobble clones terrible. My favourite scenery is the phoenix constellation in Stages 26 - 28. With Bubblun and Bobblon seperately operating their bubble shooters, I wonder who their partners are that reload the shooters from the bubble sack. If you look carefully at the bubbles you'll see the familiar faces of Monsta, Zen-Chan, Drunk, Mighta and all the other monsters from Bubble Bobble. In the SNES version of Puzzle Bobble there are many more than 30 rounds in the game with special elemental bubbles and there is a battle mode where you fight all your Bubble Bobble nemesises up to Baron-von-Blubba. I think I'll have another replay of this game for the HSC. ~No one quite did Puzzle Bobble - Like You Did! 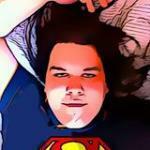 I made the thread Sticky and linked to it in the HSC thread. One of the best puzzle games (and series) I've ever played. Very addictive gameplay where you always want just one more go. The kind of game that nearly everyone would enjoy even people not normally into puzzle games. One thing that's perhaps a bit unusual about this game is that the difficulty is really variable throughout the game. One minute you have a very tough round and then a load of easy ones. I HATE round 7! That always cause me problems. Although I love playing this great game overall I do prefer Magical Drop 3 and Money Idol Exchanger. Bust-A-Move Again was the first neo geo mvs cart I ever owned. It came already inside my 4 slot mvs cab when I bought it and the cab was pretty much only being used for that game as it had the marquee covering the 4 mini marquee slots. I played the game quite a bit ( and was no stranger to the series before that ) as I waited to get more mvs games from ebay. I'll be honest though at the end of the day I enjoy puzzle games here and there and Bust-A-Move Again is a classic, but I do not love them like I do fighting games. So... I sold the kit on ebay . All the flyers were tucked inside the back of the cab still in plastic. It was in great shape and I was prolly a fool for getting rid of it, but at the time it really wasn't the reason I wanted a neo cab in my home. On occasion I regret selling it, but then again if I did not , chances are I may never have got the incredible deal I found getting the mvs kof's 94,95,96,97,98,99,01 and 03 , all english labels with shockboxes and inserts for all the games including 00 and 02 which I picked up later to complete my kof collection. I'm also not sure if its just me , but I only buy mvs carts with english labels for my collection. It makes collecting a bit harder but its the way I want my collection. Barring anything that only came out in japan like Quiz Fighters. I'm sure when I get down to it at the end and own almost every mvs cart, I'll curse the fact that I had it and let it slip away ,lol. Until then though, I'll enjoy my fighting games and thank the sale of Bust-A-Move Again for giving me all that fighting goodness. I hope its in a better place now. This is a great game. I have the 4th game on DC but i like the simplicity of the original. there was a game on Sky box for anyone who has one in the UK, called Beehive Bedlam (I think) which is just like this, is actually more fun in some ways, if u didnt have to use the TV remote to control it. its not quite as hard. Have this on NGCD , not that I am into puzzle games but it is probably the best puzzle game of all time. Bust-A-Move is awesome, and so it BAM Pocket! Its a shame Taito never took on the hardware in a big way and produced more NG games, but the again in the early 90s Taito came close to releasing a console of their own called the Taito WOWOW which obviously would have been in pretty close competition with the NG. Superb post! I've bookmarked your web site as well for the reason that I realized it is actually educational and I enjoyed reading your posts. I've bookmarked YOU for the fekkin' BAN HAMMER! ...Brendasong have been found guilty of spamming NGFL and I hereby sentence you to wear the old ban hammer deep up your ar*e for all eternity. told ya. didn't I? Didn't I?? I told ya... that Priest does NOT f*ck around! Oh yeah... he knows how to deal with them bot scumbags! My Neo Geo is in the lunch room at work (on freeplay) and people love puzzle bobble especially 2 player mode. We are currently organizing a puzzle bobble tournament that the staff can compete in to decide the PB champion! 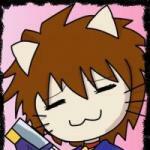 I love Puzzle Bobble, Puzzle de Pon and all the Magical Drop games. I love Puzzle Bobble. Bub and Bob are so cute! Great and classic game. This is where it all started. Not Quite. That's not where it started. The Bubble Bobble series was the first to feature Bub and Bob plus Rainbow Islands. My favourite of them all was "Bubble Bobble II" (or "Bubble Symphony" . 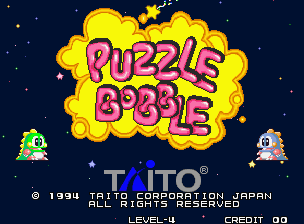 Have you ever wondered why Taito licensed only half of the Puzzle Bobble quadrilogy? I have and I don't have a clue. 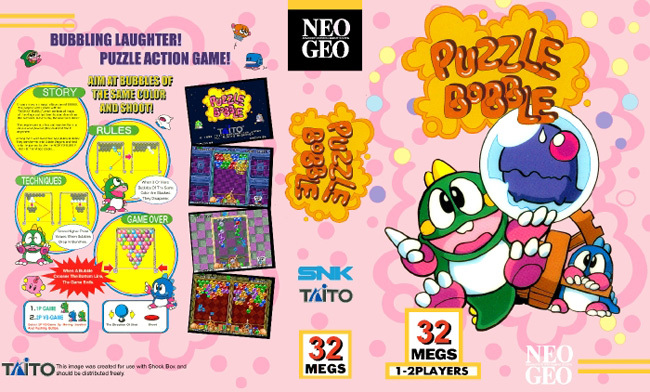 Puzzle Bobble 3 and 4 would have been great on the Neo-Geo system. I was talking about the Puzzle Bobble series, specifically. Interestingly I was reading recently that the prototype for Puzzle Bobble didn't feature Bub and Bob and it was only later Taito decided to include them. I'm glad most people here refer to the game as Puzzle Bobble. 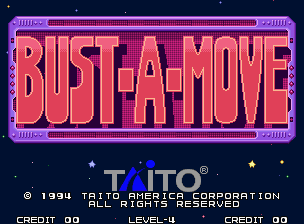 The title 'Bust a Move' sounds terrible if you ask me. Not sure what they were thinking when they came up with that name!